A couple weeks ago, I headed out to my favorite music store to check out ukuleles. I already have a 6 string uke, called a guitalele, but I don’t currently own any regular ukuleles, which sound different from the guitalele. I tried a few of the ukes on display, and then spotted an instrument I had never seen before, and did not know existed. It looked somewhat like a miniature mountain dulcimer, but could be played like a guitar. The instrument was called a Merlin, and made by the Seagull company. As far as I can tell from my reading which I did once I got home, 2013 was the first time the Merlin was available. It really is a new instrument. Seagull is one of the brands of the Canadian guitar company, Godin (pronounced “go-dan,” like the name of the sculptor, Rodin). Godin has many different brand names. Seagull is their steel string acoustic guitar line. All Godin instruments are made entirely in Quebec, or made partially in Quebec, and partially in New Hampshire. I’ve found the prices on Godin instruments to be quite good, and their electric guitars to be great (their basses are very heavy though). The Seagull acoustic instruments, including the Merlin, are rather good too, and are very fairly priced. The Merlin looked quite small compared to the acoustic guitars on display in the store. 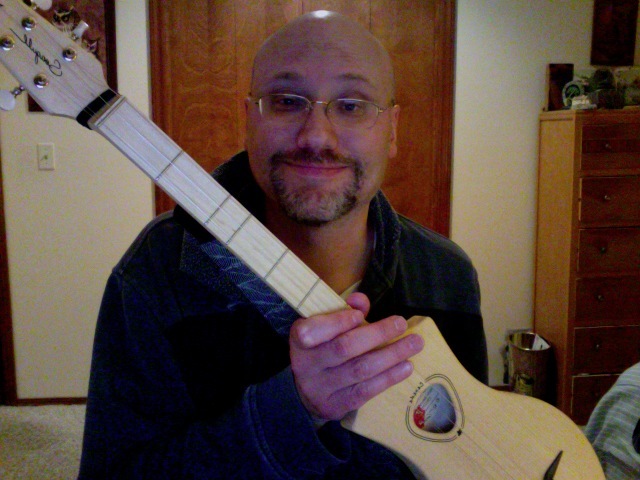 It is somewhat similar in size to a tenor ukulele, but is much more narrow, and therefore more comfortable to hold and play than a tenor uke. The first Merlin made, and the one most people own and play is tuned in the key of D. If you don’t know what that means, don’t worry about it. The instrument has 4 strings, but the two highest-pitched strings share the same pitch, and are strung in the same course, like on a mandolin. The low string is D, the middle string is A, and the two high strings are both D, but an octave higher than the low string. This is great for Celtic musicians. D tends to be the key most frequently used in Celtic music. This tuning works great for folk and rock songs too. If you are just starting out, buy a Merlin in D. Some listings online will not specify “key of D.” If you see two listings on a website, and one says “key of G,” the other will be key of D.
The reason to buy one in D is in all the tutorial videos I’ve watched, and I’ve watched a lot, the Merlin in D is the one played. If you learn a song on a D Merlin, you’ll be able to play it just as easily on the G Merlin, except the sound will be lower, and the notes and chords will be different. Since there are only a few strings, and only 7 frets, not all notes that are on chromatic instruments (most instruments out there, such as guitars, mandolins, ukuleles, pianos, woodwinds, etc.) are on this one. Like the harmonica, the Merlin is a diatonic instrument. There are enough notes for a major scale, in this case, the D scale, but not all the notes for all scales. For example, there is no C note, which means no C chords are possible to play. There is a C# in the D major scale, but no C.
Since not all notes are possible, not all scales and not all chords are possible to play on this instrument. Therefore, not all songs are possible to play on the Merlin. Besides the model which is tuned in D, Seagull also has, as I already mentioned a Merlin tuned in G. The G major scale includes the C note. The back of the neck has a dramatic curve to it, very similar to the neck on a mandolin, only thicker. I find the back of the neck to be a bit uncomfortable and awkward, but not so uncomfortable that I don’t want to play the instrument. Even though the neck is quite curved, fretting the strings is easy enough, especially compared to fretting the strings on a mandolin, considering the mandolin has not only a curved, narrow neck, but 8 strings too. You can play tons more music on a mandolin, but a mandolin is tons harder to learn. I know, I’ve tried. I’m a casual musician, and prefer playing an easier instrument, such as the Merlin. The fretboard of the Merlin is similar to that of a mountain dulcimer, but there are 12 frets (or 12 and a half as I read somewhere) on a mountain dulcimer, and only 7 on the Merlin. The Merlin is lots smaller and more portable than a mountain dulcimer. Unlike the mountain dulcimer, which is played on one’s lap or table top, stand, etc., the Merlin can be played like a guitar. I tried playing the Merlin that way, and set it on my lap, and played it in the way I’ve seen mountain dulcimers played. That worked too. It is also possible to by a model designed for those who are left-handed, and one that is acoustic-electric, meaning it has an electric pickup mounted in the instrument, and can be plugged in to an amplifier or PA system. Pretty cool. The acoustic-electric model is, as you might guess, more costly. Regular Merlins sell for $129.99, and the a/c model is $189.99. I played the Merlin in the store for quite awhile, and was astounded by how loud such a small instrument could be. Also, it seemed much easier to learn than guitar. I could tell that some chords can be played by fretting only one string, which is great. The Merlin sounded somewhat like a mountain dulcimer, but also quite a bit like a banjo. I did not buy the one in the store because it had obviously been played a lot by other customers and looked used. I found one for the same price online, $129.99 (with free shipping) and bought it. I noticed that Godin sells strings especially for this instrument, so I bought a pack of strings too. I got the Merlin and strings from a company called Elderly Instruments. (They sell new instruments too, not just used, “elderly” instruments). According to their site, their guitars and other instruments receive an “expert setup.” Which means someone takes a look at the instrument and adjusts it if necessary, before shipping it out. I’d never bought anything from this company before. I just looked around at the sites of various merchants, hoping to find one advertising that their instruments were set up before being sold. Many instrument merchants sell their instruments without inspecting them. I’d rather mine were looked at first. I have found no hard shell cases available for the Merlin. I did find a gig bag for $19.99 with free shipping from some online merchants. It doesn’t appear to have much padding. I found a deluxe, better padded gig bag for the instrument, but could not find any for sale in America. I found two small Canadian online merchants selling the deluxe gig bag. One charges $75 shipping to the US, and the other doesn’t ship to the States at all. Since I didn’t see any deluxe Merlin gig bags for sale from USA merchants, or even on ebay, I’m guessing Godin is no longer making the deluxe bag, which is too bad. Either that or Godin is only selling these through small Canadian merchants, but I doubt that. I bought the regular gig bag. The padding is ok. Best not to drop the instrument, of course, but even a little padding helps. The Merlin is a tight fit in the gig bag. Takes a bit of patience, but worth it, in my opinion. Since I don’t yet know how to play this instrument well, I won’t be putting a video of myself playing it in this post. I will instead include a review/demo video by a guy who knows how to play this instrument. The Merlin in the video has a top which is different from the one I own. I have a Merlin with a spruce top. The instrument in the video has a mahogany top. The spruce top color looks almost identical to the rest of the instrument, as you have already seen in my picture at the beginning of this post. Merlins with spruce tops have a tone that is a little brighter and louder than Merlins with mahogany tops, so I’ve read and heard people on youtube say. I tried both versions at a music store, and did not notice a huge difference in tone between the two. Even so, I prefer the spruce top, in part because I think it looks better. And, it does have just a bit more punchy tone than the mahogany model. Both models sound wonderful. Merlins come equipped with a strap button on the back. If you want to use a strap, you’ll need to buy a strap adapter, or else use a piece of string to attach the strap to the front part of the instrument, just below the tuning pegs. You can see the black line of the strap adapter in my picture. I attached a Neotech-string style strap adapter to the instrument and strap. I’ve since bought a Martin strap adapter, because it is a leather band, and not a longish string.. this looks better, I think. But the Neotech works fine. Also, many guitar straps come with what looks like a short shoe string attached to one end of the strap. You can use that little string to tie the strap to the instrument, but tie it on good. I prefer a strap adapter. You won’t need a teacher to learn this instrument. There are LOADS of tutorial videos on youtube. One youtube channel is simply called “Lets Play The Merlin.” The older gentleman on that channel goes over the basics in three of his videos, and has 5 other videos which are song tutorials. If you want to learn lots of songs, check out the channel called “Ryan’s Seagull M4 Lessons.” Ryan is great. He likes to figure out how to play and teach not only folk and Celtic songs, but tunes by classic rock and hard rock bands as well. There are many many other teachers on youtube. Browse and find the ones you like best. And, you can find some fretboard diagrams showing where notes and chords are, if you look. Go to your favorite search engine and type in “seagull merlin chords,” or “seagull merlin fretboard” for some diagrams. Not many Merlin songbooks out there that I know of. A guy on youtube who has a channel called “lewdite” sells two, if I remember correctly. These are songbooks for songs played with a pick, a strumming style. Unlike most Merlin players, I like plucking the strings with my fingers instead of a pick most of the time, so I didn’t buy a songbook. I prefer to learn from the video tutorials anyway. Ok then.. here’s a review and demonstration video. ← guess when: live at the treasure valley celtic festival! You helped “wear out” the store one and then went online — you are a jerk! F-off. Guitars, merlins,and other stringed instruments in music stores are there not to be purchased immediately, but to be played first. If the instruments were for sale only and not to be played first, they’d all be behind the counter, and no one would be allowed to play them before purchasing. How do you figure out what instrument to play and perhaps buy if you’ve not tried it first? If the merlin at Guitar Center were not already so ragged, I might have bought it, but I doubt it. I suppose I could have asked the folks working at the store for a new one, but I hadn’t yet made up my mind to buy one. When I did make up my mind, I was at home, and decided to purchase one online. I wasn’t being a jerk when I was playing the merlin in the store and trying to make up my mind, I was being a sensible customer. Will mountain dulcimer songbooks be helpful playing a Merlin ? My best guess is no, because mountain dulcimers have more frets than the Merlins. Looks like the mountain dulcimers tend to have 20 frets. The Merlins only have 7. Will learning Ukulele help learn the Merlin? No, doing so will mess you up. The uke is tuned quite differently. Also, two of the Merlin’s strings are meant to be played together. What this means is when you are playing the merlin, it feels like you are playing a 3-stringed instrument. The uke is a FAR more versatile instrument. I wrote a post comparing many different stringed instruments, including the uke, merlin, cigar box guitar, etc. Click “music” in the tag cloud and you’ll find it. Thanks for your question. Which Merlin (key of D or G) do you think would be more versatile in terms of playing alond with other instruments (guitars, banjos,etc.)? Tough call. I think more of the youtube lesson videos are in D. If you want to play Celtic music, then definitely pick D.
Regarding bluegrass and Americana – these are genres I enjoy listening to, but I don’t know which key would be used most often. The important thing is – with guitars and banjos, I think either key of Merlin would be ok, since people playing on guitar or banjo can play in loads of keys, including both D and G.